Looking for a Used Murano CrossCabriolet in your area? CarGurus has 46 nationwide Murano CrossCabriolet listings starting at $8,988. Nissan's Murano CrossCabriolet enters what very well could be its last year with a price drop and a corrected fuel-economy estimate, also in the same downward direction. 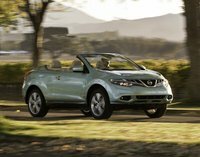 This head-turning high-riding all-wheel drive convertible for 4 is headed off the production line sometime after the standard Murano moves into its third generation for 2015, having just 3 years in production for the quirky cabrio style. As a midsize crossover the Murano is set to be in exceptionally high demand, but every family has its odd duck—and the CrossCabriolet certainly fits that bill as the only convertible midsize crossover in production today. Not tomorrow, though, according to company spokespersons, and that's sad news for lovers of attention-fetching ways to worship the sun with plenty of cash. Pricey as it is, the Murano CrossCabriolet's top-down approach has its structural sticking points. The standard Murano is a gem without this issue, identical as it is though still having its top secured to one spot and a liftback, but the CrossCabriolet tends to turn off drivers given a body and windshield shudder over heavy bumps. Most drivers like to make use of AWD if they have to get it, so any apparent structural weaknesses will definitely kill an adventurous mood. Its obligatory AWD could be the reason it doesn't drive like a brick on a boulder, but it seems like just another expense to drivers who look at a premium fuel economy around 17 mpg city/22 highway and see their off-time spent at the gas station, if not overspent on gas. Alas, comfortable accommodations for 4 adults and at least a suitcase set (albeit a 3-piece with the top down, still a convertible best), ample V6 power and an elevated riding stance were not enough to help the CrossCabriolet captivate the crowd Nissan hoped. Passers-by sure can't get enough, but drivers for this sort of retro are few in the first place. Piling on that fuel economy with a hefty starting price doesn't help its retail, either, but the CrossCabriolet is a surefire favorite for the used market on down the line—and not just for its visual and production-run rarity. Fetching an impressive zip-to-60 mph time of just over 8 seconds with a continuously variable transmission (CVT) routing power from a 3.5-liter V6 good for 265 hp and 248 lb-ft of torque, alongside a very confident cornering posture, the CrossCabriolet is as much a rare master of the road as its hardtop Murano siblings. Until the CrossCabriolet a 12.3-cubic-foot trunk was something of a unicorn for soft tops, and its top-down capacity of about 2 golf bags and an oversize suitcase easily rivals many top-up cabrio capacities. The interior is top notch, loaded with upmarket features (including a Bose sound system) and intuitively executed with a timeless style complete with leather upholstery and leather, chrome and wooden trim. To be sure, the CrossCabriolet will someday fetch a pretty penny, just probably not as shiny as Nissan asks to get one with that new-car smell today. 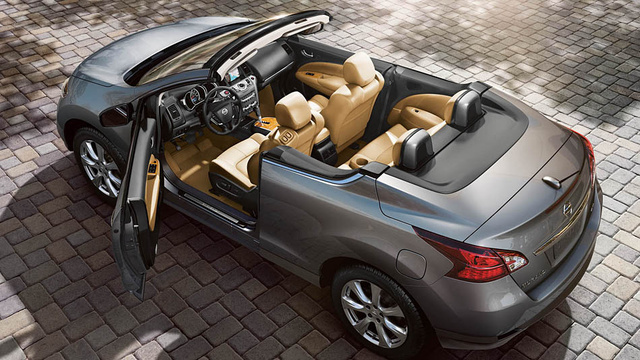 What's your take on the 2014 Nissan Murano CrossCabriolet? Tessious Love the design. Looking for a unique design with ample trunk size. This would be my third Nissan with a Mercedes in between. My Nissan's were far superior. I he I can find a low mileage Cross Cabriolet. Users ranked 2014 Nissan Murano CrossCabriolet against other cars which they drove/owned. Each ranking was based on 9 categories. Here is the summary of top rankings. Have you driven a 2014 Nissan Murano CrossCabriolet?